Vézelay, Church and Hill comprise the Benedictine Vézelay Abbey and the surrounding hill town. A monastery has existed here since the 9th century: the buildings have been rebuilt several times since. The last major refurbishement started in 1840 and was executed by Eugène Viollet-le-Duc. He restored the Romanesque church to its former glory after centuries of neglect had left it to ruins. 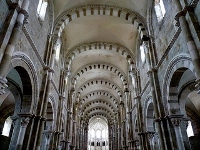 Vézelay Abbey was a major starting point for pilgrims on the Way of St. James to Santiago de Compostela. The church was an important place of pilgrimage in the Middle Ages as it kept relics of Mary Magdalene. It also is strongly connected to the Crusades: St Bernard preached the Second Crusade there in 1146 and Richard the Lion-Hearted and Philip II Augustus met there to leave for the Third Crusade in 1190. Vézelay, Church and Hill was the last destination of my short trip to the Champagne and Burgundy regions of France. 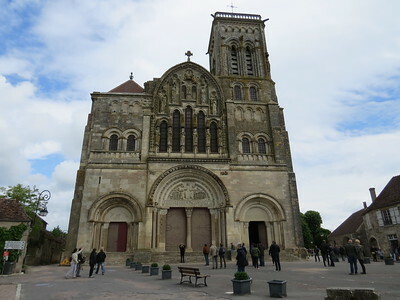 Vézelay lies about an hour and ten minutes drive west from the Cistercian Abbey of Fontenay; both WHS can easily be combined into one day trip from Dijon or even Reims. The hill with the church on top is a landmark visible from afar. The site has been an important place of pilgrimage since relics of St. Mary Magdalene were brought here in the 10th century. So it comes as no surprise that the same location is also part of the French Route to Santiago de Compostela WHS. It is actually the starting point of one of the four main pilgrimage routes to Santiago. The steady flow of pilgrims brought considerable wealth to the town in the Middle Ages. On my drive up there I saw a couple of long distance hikers too (the pilgrims of the modern age). 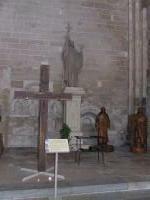 The Abbaye Sainte-Marie-Madeleine de Vézelay is the main feature of this WHS. The Abbey church is undergoing major restorations at the moment, especially near the choir which is closed to visitors. Probably the most interesting part is the variety of sculpted capitals on top of the columns in the interior. The decoration scheme with the polychrome ribs and these capitals is an architecture buff's dream: "it gives a delicacy and refinement to the interior"1. I guess this is also why Vézelay Church is considered as "one of the outstanding masterpieces of Burgundian Romanesque art and architecture." Entrance to the church is free, and there are nice views on the surrounding countryside from its grounds. To be honest about this site's values: I found Vézelay a bit of a tourist trap. The small town sees over one million visitors a year, and is totally geared to it. There’s a main street that leads up to the church, lined with souvenir shops and restaurants. The side streets are more quiet, but nothing special. I had seen it all in an hour. I followed a sign to the ‘Porte Neuve’, hoping to stumble upon something historic, but enjoying this former city gate is hindered by reconstruction too. When I look now at photos of it on the internet, it seems that 'the other side' (which I could not get to) is much more interesting. The city walls were erected in the 14th century to keep out the “armed gangs” that were attracted to the flourishing pilgrims trade. Although I wasn't satisfied by the site itself, I take two good memories with me from my visit: I ate a great lunch at Restaurant du Cheval Blanc. Tasty lamb and a chocolate dessert to die for (it seemed that all female customers choose that one from the menu). And I met up for a short chat with fellow WHS traveller Adrian, who was visiting from Luxemburg. He was doing the Fontenay – Vézelay double WHS day the other way around than I did. I visited this WHS in July 2013. Vézelay is a very small town in Burgundy and it also forms part of the Route of Santiago de Compostela with many pilgrims visiting the Church. Like John Booth, I particularly liked the collection of wooden crosses in the Church. The façade is unique but it needs to be taken care of as soon as possible since the elements are getting the upper hand. This site definitely does match the criteria for a WHS. Should anyone not just read its history, but also compare its architecture and decoration to contemporary churches, you will find its importance as an architectural work of art from the middle ages. Especially the tympanum in the narthex (entry hall) of the church is important to the history of medieval sculpture and can be found in almost any book on art or architecture dealing with this period. Furthermore, the 19th century restoration/reconstruction by Viollet-le-Duc is almost as much worth calling a heritage 'site' on its own. It reflects the thoughts and views on restoration in France's very first years as a country aware of its valuable historic heritage. Untill the 19th century, all evidence of France's history as a kingdom was considered to be worthless; from about 1800 on, it slowly started to go the other way around. The building up of a new Franch nation after the Revolution was to be nurtured by these reflections on the past, showing France's former excellence in building, craftmanship etc. The most interesting aspect of the church of St Mary Magdalen was the collection of wooden crosses brought here in 1946 from all over Europe during a march for peace. One cross came from a group of POWs from Germany who had been held near here. The village of Vezelay held a few other gems; the views over the villages of Asquins and St Pere-sous-Vezelay from the ramparts and the gateways of Barle and St Croix. But best of all were the picturesque villages and the town of Avallon passed on the bus journey to Vezelay from Montbard station. My wife and I last visited Vezelay Abbey over thirty years ago, and I found it one of the most exciting and enduring experiences of my life. I am nearly 88 years old and that glorious place is still a shining memory' It's whole ambience and history is incredible. It is one of a number of religious houses that we visited, but Vezelay sitting on top of that hill, is the most outstanding. I am doing a blog on religious houses in France on my website and hope to include Vezelay, if I can obtain some pictures that do it justice. In our trip to France we have been to the beautiful village of Vézelay , famous from the 11th century because of the belief that the Benedictine abbey on the top of the hill held the relics of Mary Magdalene, that became the object of one of the greatest Christian pilgrimage and also the point of departure of one of the pilgrimage routes leading to Santiago de Compostela, that profited to the town: it counted in the 12th century 8000 to 10000 inhabitants, many for the period. On the Easter day of the year 1146 was held on the hill the assembly that convoked the departure of the Second Crusade: St. Bernard preached in the presence of the king Louis VII, the queen Eleanor, many lords, prelates and people from all walks of life. In 1190 Philip August and Richard the Lion-Hearted reunited here their armies and departed to the Third Crusade. The king St. Louis, very devoted to the Madeleine, visited Vézelay four times and in 1217 St. Francis of Assisi founded on the hill the first Franciscan convent in France (La Cordelle), that now contains of the original building only the chapel. The beautiful abbey church, founded in the 9th century was rebuilt after a fire from 1120 in the Burgundian Romanesque style and finished with the Romanesque and Gothic choir. The church, that was in bad conditions after the French revolution, was restored from 1840 to 1859 by Viollet-le-Duc, that entirely modified the façade and the portals, that have only a few original parts; only the tympanums and two of the three towers are original. The narthex has three naves supported by pillars and three portals with relieves. The stunning double central portal has relieves on the tympanum, with the Mission of the Apostles, on the pillar, on the internal and external arches and on the lintel. The interior of the church has three 62 m long naves slightly distorted by the downward thrust of the groined vaulting, a short transept and a nice choir; the main arcade has horseshoe-shaped arches with stones of two colours and the capitals of the pillars have beautiful relieves. The crypt, built in the 9th century and reconstructed later, has three naves and some frescos and contains the relics of St. Mary Magdalene. The cloister, entirely reconstructed by Viollet-le-Duc, gives access to the chapter house, that has nice ogival vaulting. The village is encircled by walls with the towers Pink, of the Ursulines and of the Pigeons and the gates New, of the Holy Cross and of Barle. The ancient streets of the village conserve the church of St. Stephen, the cloister of St. Pierre, the convent of the Ursulines, the old hotels Fosseyeux and of the Abbey, the monks' dormitory, the well of St. Stephen, the town hall, the tower Gaillon, the centres of Jean-Cristophe and of St. Magdalene, the cemetery and many houses (the nicest are that of Romain Rolland, of Theodore de Bèze, of Max-Pol-Fouchet, of St. Bernard, of Pontot, Chapter, of the Pigeons, of Georges Bataille, of Jules Roy and of the Police) with sculpted portals, nice windows, small towers and wells made of wrought iron. I liked this village very much especially because of the beautiful architecture and decorations of the church. It's worth to be visited if you are in Burgundy (if you go there you must leave the car out of the centre) and it justifies the inscription also because of its big historical importance. Now anyone doing a relaxing touring holiday in Burgundy would give Vezelay a few hours. Michelin gives it 2*. The walk up to the abbey and ramparts through the main street of old houses is very pleasant. No doubt also someone with religious convictions could find the religious significance of the place moving. But a WHS?? I think not. This hill town in Burgundy contains the 12th century Benedictine abbey church of Sainte-Marie-Madeleine which some consider “one of the most important surviving monuments of architecture and sculpture of the Romanesque period”. By the 16th century it was already on ruins and was partially razed during the French Revolution. The building you see is that which was reconstructed in the mid 19th century though much of the decoration appears to be considered original. France has 28 WHS sites and 8 of these are entirely or mainly of religious buildings (including 4 cathedrals) There are a further 3 cities (Strasburg, Ile de France, and Lyons) which include yet more cathedrals. And there are another 4 religious buildings including 3 more cathedrals within its 38 entries on the Tentative list! France also has a site called “Routes of Santiago de Compostela” – all 3 of whose starting points (Bourges, Mont St Michel and Vézelay) are also WHS in their own rights and Vezelay has 2 buildings, including its Abbey, inscribed on the list of buildings for this site too (I might add that UK is not immune from this compulsion to nominate Religious buildings but has so far kept this to 3 Cathedrals and 1 ruined abbey with only 1 further ruin on its Tentative list. Italy, Spain and Germany might run France close but would not, I think, catch it!). In my view this is overkill. If every Christian building in Europe which could be considered “significant” by the experts for its architecture and/or religious/historical importance were to be nominated then lots of countries could finish up with lists even longer than that of France! Choosing the best might just about be acceptable for a small country with few other potential sites but France seems hell bent on“flooding the market”! With the best will in the world Vézelay is a second ranking site. It architectural credentials are limited and somewhat specialised. Moreover its religious credentials are covered by another site. I see little “uniqueness” in yet another pilgrimage abbey especially a heavily reconstructed one. Still you have got to give the good burghers of Vezelay top marks for playing the UNESCO game to the full. To get 2 listings for 1 place shows that they have been doing a wonderful job for their tourist industry! They got in very early in 1979 and, when the Compostela route was added in 1998, managed to keep their site separate when really it should have been subsumed within the greater. 3.5: Aitia David Berlanda Argo Antonio J.
Vézelay can easily reached by car from Dijon or even Paris or Reims. The second location is Corbigny, about which is no further info given in the nomination. It's another pilgrimage site with an Abbey church, some 30kms north of Vézelay.